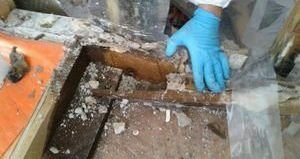 When a water damage situation causes mold growth in your home, call the water damage Los Alamitos and mold removal Los Alamitos experts with 911 Restoration Irvine. Our crew is trained to take control of the situation, so you can have peace of mind that your home is being repaired by licensed, bonded and insured technicians. Don’t let a small water leak turn into an expensive repair bill that also causes structural damage. At the first sign of a water damage, call the water damage Los Alamitos and mold removal Alamitos experts with 911 Restoration Irvine. Our local community is the core of our focus. Making sure they get the attention and help they deserve is our number one priority. When our water damage Los Alamitos and mold removal Los Alamitos experts arrive at your property the first thing they do is conduct a free visual inspection. This allows them to assess the severity of the damage and draft a detailed repair estimate. We strive to keep our customers as updated and engaged as possible, so they have some expectations during the repair and restoration process. Our water damage Los Alamitos experts will prepare a comprehensive repair plan. As soon as we get the OK to get to work, the water damage Los Alamitos experts start extracting all stagnant water in the affected areas with powerful sump pumps and mitigation machines. Then with advanced drying equipment, we dry out and sanitize what had been affected with eco-friendly products. Then our mold removal Los Alamitos team arrive. Mold can very easily be visible and also be invisible with just the naked eye. This is why we rely on infrared cameras to located moisture spots in areas we can’t see. You can rest assure that our water damage Los Alamitos and mold removal Los Alamitos pros will provide you with fast and efficient service. When you decide to work with our team, you won’t have to worry about not getting answers in a timely manner. We assign every customer to an experienced project manager who will help file your insurance claim for you. We know what to prepare and what to submit in order to get it right the first time. Our project managers will even coordinate meetings with the insurance adjusters on site as needed. So you don’t have to worry about a thing, other than keeping your family safe. Keep your home safe after a water damage, and call the water damage Los Alamitos and mold removal Los Alamitos experts with 911 Restoration Irvine. Your Fresh Start is one phone call away!